Joe Brew's tweet - "The Catalan independence movement has been called "xenophobic" by some of its pro-Spain critics. But the actual data on xenophobia in Catalonia are quite clear. Xenophobia is significantly higher (37.7%) among Catalans against independence than those for it (24.7%). " Xenophobia is significantly higher (37.7%) among Catalans against independence than those for it (24.7%). 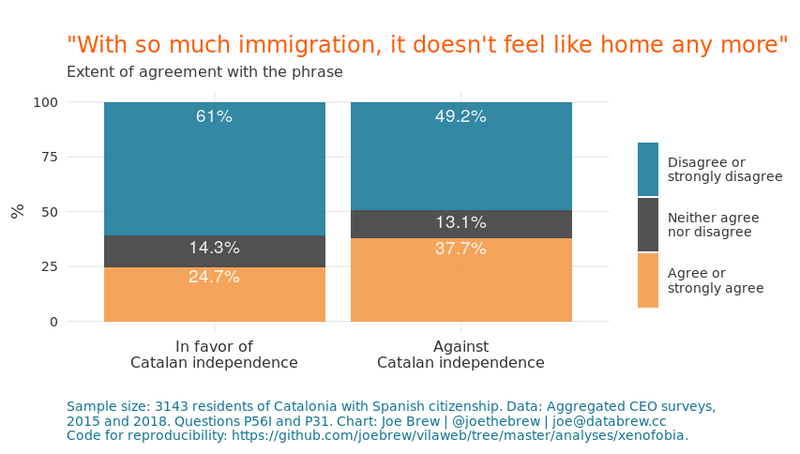 Not to mention that the poll asks about immigration, while Spanish colonists are far more xenophobic against Catalans, which are not immigrants, than against the immigrants. Therefore, this poll results' actually hide the bulk of the xenophobic data among the Spanish population. Joe conveniently forgets that pro independence Catalans, who despise being called Spanish, is itself Xenophobia. Centristas y tabarnios 🇪🇺: Ejjjjjque los NAZIonalistas supremacistas catalanes son etnicistas de ultraderecha amigos de los nazis flamencos Puchdemont es nuestro Salvini y Kim Jong Torra patatas. Realidad: Son más suicidas que los propios unionistas. De Catalaanse onafhankelijkheidsbeweging wordt beticht van “vreemdelingenhaat” door sommige van haar pro-Spanje criticasters. Maar de data daarover in Catalonië zijn heel duidelijk. Vreemdelingenhaat is aanzienlijk hoger (37,7%) onder Catalanen die tegen onafhankelijkheid zijn. Now do the same thing with hispanophobia, which is a form of xenophobia. Por would It endanger your payments? Come on, we all know you're on GenCat payroll. The real point is #HispanoPhobia, moron. Nazis weren't xenophobic with foreigners as Japanese, they were ENDOphobics vs German Jews. The Identitarian Axis that has controlled Catalonia for years is abnormally hostile toward the rest of spaniards & catalans against secession. We all hate Spain. But lets all give ourselves a big anti-xenophobic pat on the back. Lá se vai a narrativa. Massa que n'hi ha, en qualsevol cas.